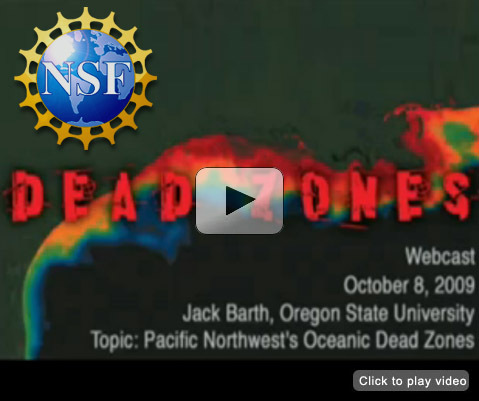 Jack Barth of Oregon State University discusses dead zones of the Pacific Northwest in a webcast originally broadcast on October 8, 2009. Yet another ecological scourge may earn a place on the ever-lengthening list of problems associated with climate change: the formation of some types of so-called "dead zones"—marine expanses covering hundreds, or even thousands, of square miles that become too oxygen-starved during the summer to support most life forms. In a webcast that features a Q&A with reporters, Jack Barth of Oregon State University explains how climate change may be promoting the development of Oregon's dead zones, summarizes the ecological impacts of dead zones, discusses why scientists believe that dead zones are now regular summer fixtures in Oregon's coastal waters, and describes his research team's pioneering methods for studying dead zones in Oregon and Chile. The results of Barth’s analyses of the Pacific Northwest’s dead zones are particularly surprising because most of the Earth’s 400+ dead zones are caused by pollution dumped into coastal areas by rivers. Next: SOS - Is Climate Change Suffocating Our Seas?